Mahindra & Mahindra is planning to unleash a number of new vehicles for the near future in response to the growing competition in compact SUV segments. The largest UV maker in the country has had tough times due to the arrival of Maruti Suzuki Vitara Brezza and Hyundai Creta, as both lead their respective segments and the SUV sales table in the last two years. The homegrown automaker has not given up on the sub-four-metre SUV space yet and is trying to create a huge impact with the SsangYong Tivoli based S201 with most powerful engine in its segment, dual-zone automatic climate control, monocoque construction, disc brake on all four wheels, etc. Currently, Mahindra has the TUV300 as a decent seller in the there with traditional boxy design and a workhorse ladder-frame chassis. In the past one year, the TUV300 has averaged around 2,000 unit sales monthly and understanding its market positioning, Mahindra recently introduced the nine-seat TUV300 Plus. Subsequently, the company expects more from ‘battle tank inspired’ TUV300 despite introducing another product in the same price bracket. 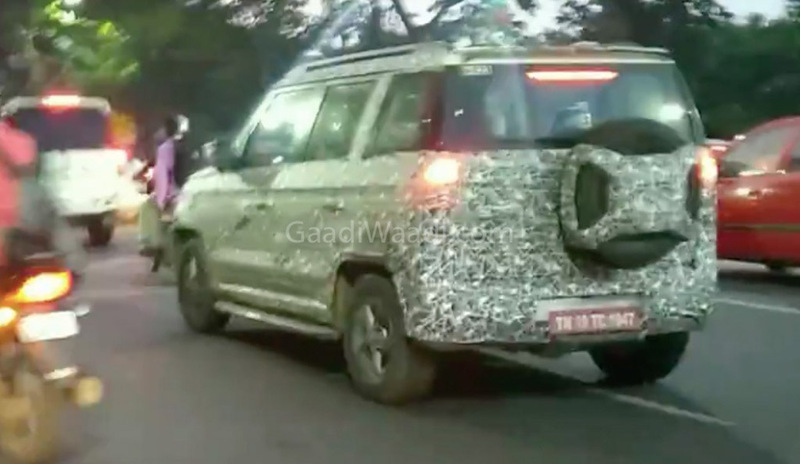 The reported Mahindra TUV300 facelift’s existence is ensured courtesy of the first spy bangers. The facelifted TUV300 is expected to bring a refreshing vibe to the range that starts at Rs. 8.34 lakh and goes all the way up to Rs. 11 lakh (ex-showroom). Sold in nine variants, we will more likely be seeing added standard safety features like dual front airbags, ABS with EBD, reverse parking sensors, seat belt reminder, speed sensing door lock and speed alert warning system right from the base variants. The test prototype appears to be in early stages of development but some of the changes can be clearly examined. Up front, the facelifted TUV300 may get an updated grille and bumper with chrome embellishments but the overall upright profile with tall shoulders and pillars will remain identical to the existing model. The rear end could also feature mild tweaks to stretch the lifecycle of TUV300. We believe the major revisions would only happen inside the cabin as well as features wise. The same dual-tone beige and black interior theme could also be found on the facelift with slight updates but the top-ends may feature a bigger touchscreen infotainment system with Apple CarPlay and Android Auto connectivity. It should double up as display for reversing camera. Moreover, regular upmarket features like cruise control, panoramic sunroof, electrically adjustable ORVMs, cooled glovebox, day/night IRVM, rear AC vents or roof-mounted unit as in Marazzo, etc may also be in the pipeline. The seven-seater SUV is powered by 1.5-litre mHawk80 three-cylinder turbocharged diesel engine that produces 84 bhp and 230 Nm in the five-speed MT spec and 81 bhp and 230 Nm in the AMT version. The rear-wheel-driven SUV has claimed fuel economy of 18.49 kmpl. Mahindra could pull out all stops and introduce the new and lightweight 1.5-litre D15 diesel mill transversely-mounted in the Marazzo making 123 PS and 300 Nm – allowing the TUV300 facelift to become more economical. It makes sense as the powertrain is already BSVI compliant and perhaps a new petrol engine could enable Mahindra to price the TUV more affordably against five-seat competitors. The facelift is reported to launch sometime next year with an even stiffened body structure.